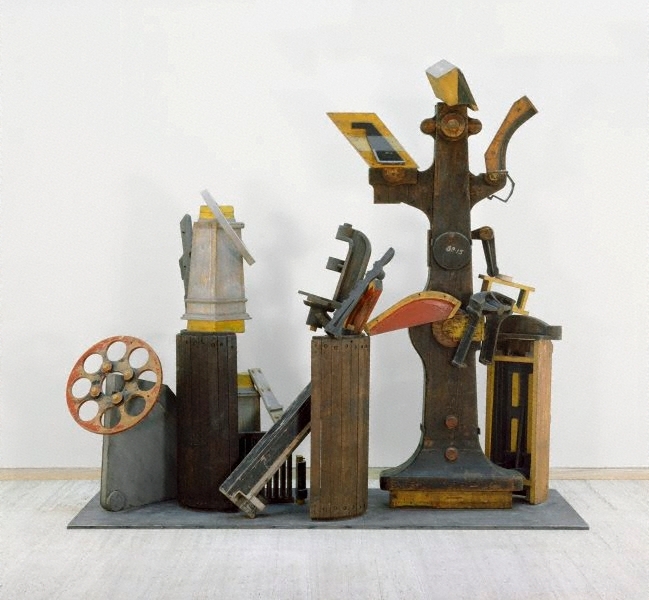 Throughout the 1980s Klippel worked on a series of large wooden assemblages composed of discarded wooden patterns for machine parts. Colin Lanceley had discovered them in an industrial foundry in Ultimo during 1964. Decades later they proved ideal material for Klippel's explorations into the subtle relationships of mass, volume and planes. 'Opus 714' is a masterwork from this series. It grew out of Klippel's earlier experiments with photographic collages, as in 'Philadelphia', 1979, also in the Gallery's collection. Often considered a miniaturist, Klippel reveals in 'Opus 714' a shift towards large, monumental forms. He has achieved an apparently random yet perfectly balanced composition of dramatic colour, space and solid frontality. The disparate elements in 'Opus 714' have been brought into an asymmetrical yet balanced whole, in which the relationships of the static parts create an 'organic' energy. The arts in Australia: Visual arts , 'Modernist sculpture in Australia', pg. 18, Port Melbourne, 2005, 18 (colour illus.). Jeni Cooper (Editor in Chief), Sunday telegraph , 'Big sculpture to be digested in bits', Sydney, 06 Oct 2002, (colour illus.). In 'Express Arts' section. Sue Cramer, Cubism & Australian art , 'This Spiritual Adventure: Postwar Cubism 1950-1979', pg. 154-197, Melbourne, 2009, 166 (colour illus.). Antony Davies, The Australian , 'Works of art inspired by the junkyard', pg. 8, Sydney, 05 Sep 2007, 8, 8 (illus.). Rob Ditessa', Artist's palette , 'Icons on show', pg. 54-59, Sydney, 2000, 59 (colour illus.). Robert Klippel , 'Still point in the moving world: Sydney 1980s-90s', pg. 186-223, Sydney, 2002, 186 (colour illus., detail), 187, 191, 211 (colour illus.). Benjamin Genocchio., The Australian , 'Cooler kind of Mecanno', Sydney, 23 Aug 2002, (colour illus.). Bruce James, Art Gallery of New South Wales handbook , 'Australian Collection: Painting and Sculpture', pg. 102-181, Sydney, 1999, 173 (colour illus.). Giucio Montagna (Editor), La Fiamma , 'Klippel: Australia's greatest sculptor', pg. 17, Leichhardt, 07 Aug 2002, 17 (illus.). Barry Pearce, Australian art: in the Art Gallery of New South Wales , 'The enduring image', pg. 265-266, Sydney, 2000, 275 (colour illus. ), 301. Michael Reid, The Weekend Australian , 'Luminary ways of mover-shaper', pg. 36, Sydney, 05 Oct 2002-06 Oct 2002, 36 (illus.). Enter Art , Sydney, 2000, sheet number 8 (colour illus.). Education kit produced by the NSW Dept of Education and Training as teaching resource for primary school teachers. Jane Somerville, Look , 'Looking back: celebrating 20 years of words and images for Society members', pg. 10-11, Sydney, Oct 2005, 10 (colour illus.). David Tunny., Look , 'The sculptor's studio: Robert Klippel', Heidelberg, May 1990, 3 (colour illus., detail), 13 (colour illus.). Australia's best: artists & designers , 'Robert Klippel', pg. 22-23, Melbourne, 2004, 22, 23 (colour illus. ).